There’s only one cocktail I ever truly crave- a Negroni. A perfect blend of equal parts sweet vermouth, Campari and gin. Recently I had a variation on this classic at Seattle’s Bar Ferd’nand that has become my new favorite iteration. Replace the Campari with Cardamaro, a bitter-sweet amaro tinted with citrusy undertones and a lovely fennel finish- and you get a Cardagroni. The boys at Bar Ferd’nand really know how to improve on a good thing. One other thing to love about Bar Ferd… they have the best bar snacks. Ever. Grazie! Thank you very much for your compliment. 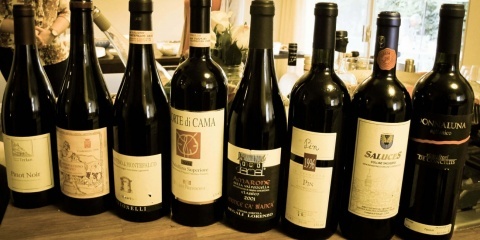 I love Italian wine- especially Barolo! Tanti cari saluti dalla California! Those snacks look worth the visit alone! Here in NJ/NY we haven’t quite made the leap to bar snacks like they have in Roma or Milano. I’m also not familar with that digestivo, but I’ll have to look around. I love fennel and that sounds good. Hi John… just saw this comment- thanks! Cardamaro is definitely available on the east coast- you should seek it out. Really amazing! You really need to go see Adam at Artusi. Not only does he make a great negroni, and negroni variants, he knows a TON about Italian wine. And their wine list is fantastic!